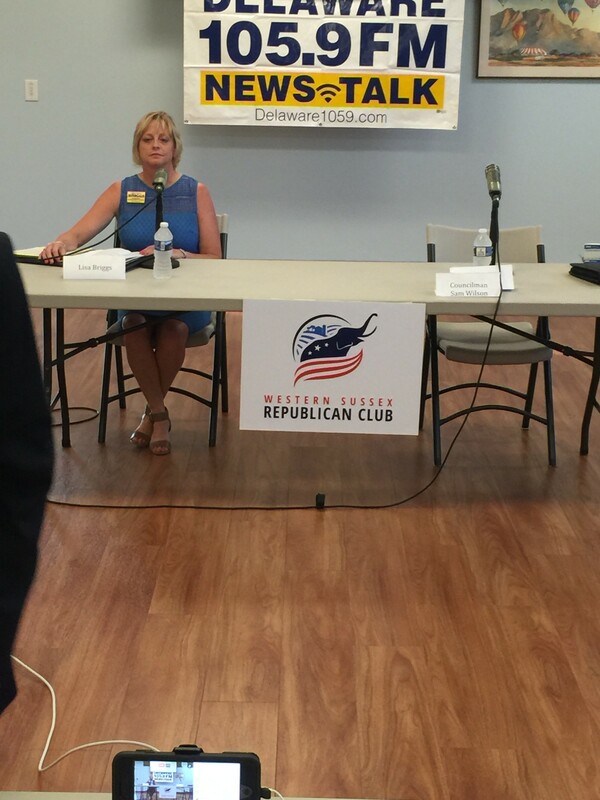 This past Thursday night, I, and another hundred or so people attended a candidate debate for the 35th Representative District Republican primary. But I decided to wait and give my opinion until today, on Bob’s birthday. Don’t say I never gave you anything Bob. The debate was mainly for the two candidates in the primary for the 35th district, incumbent Rep. Dave Wilson, and challenger, Bob Mitchell. 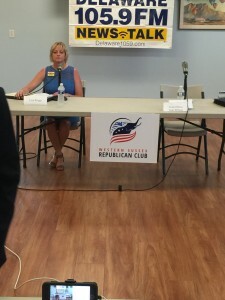 Prior to those two debating each other, the organizers of the event, The Western Sussex Republican Club, had also invited the two Republican primary candidates for the 2nd District, for County Council to debate. This would be incumbent Sam Wilson, and challenger Lisa Briggs. Here is a photo of that debate. On the Dan Gaffney Show, the morning after the debate, Sam Wilson stated he did not attend because the event was not held within his district. The event was held at the Bridgeville Library, which technically is not his district. However, Mr. Wilson did manage to ride all the way to Rehoboth to be on the radio with Dan Gaffney, to say he couldn’t be in Bridgeville the night before. Following this statement, the WSRC again contacted Mr. Wilson and asked if he would participate in a debate with Mrs. Briggs if it were held at the Greenwood Fire Company, which is within his district, again Mr. Wilson declined. The fact that Sam Wilson will not appear within his district, or anywhere close, raises some questions. Is he just arrogant? Is he afraid to go head to head with his opponent? Is he concerned that voters in the district will see how frail he is following his recent health issues? Will the voters be afforded the chance to hear from Sam Wilson prior to the primary? Maybe not. Now this brings us to the main event of the event. Dave Wilson schooling Bob Mitchell on a number of issues, issues which Bob Mitchell chose to make issues himself. Let me say in the beginning, while Bob Mitchell presents himself as a well spoken and knowledgeable candidate, well he is well spoken, but his knowledge is left in question by his own words and contradictions. 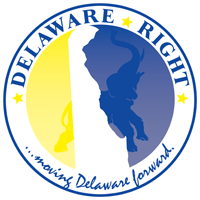 The debate was moderated by Dan Gaffney from Delaware 105.9, and as always, Dan is nothing but a skilled moderator and professional. I will put up a link to the audio of the entire debate between Rep. Wilson and Bob. Please understand that I am giving my opinion of what I heard, I may have to skip around, from the beginning to the end, to link some of the inconsistencies of Bob’s attacks on Rep. Wilson. I will in many cases be giving time stamps so my readers can listen to the audio and know where I am talking about in the time line. In the beginning, the topic was the state budget, and how Rep. Wilson had voted on the bond bill. Bob threw around some figures about the state budget, the deficit spending and debt the state is facing, he spoke as if he had researched the spending of the state in-depth. But did he? Because late in the debate, the question was asked, if the Republicans were in the majority in Dover, and you could cut any spending, what would you cut. Now you would think, someone who wants the voters to believe he is “Banker Bob”, would have some good ideas about how to save money, and since he had thrown numbers around in the beginning you would think he had studied the spending of the state. But when asked, at (43:20) in the audio, he said, “I have not sat in the committee to look at the budget and to look and do line items”. He then admitted anyone can print out and study the budget. So it would seem the only thing “Banker Bob” studied in the budget was how Rep. Wilson had voted. It seemed that in talking about the spending bills, Bob got confused about the budget, and the bond bill. Rep. Wilson pointed out the difference, that the bond bill is for capital improvements, which means if you vote against it, you are voting against road improvements, and other infrastructure spending. To this Bob said at (11:22), “If you have $4.1 and you need to build a school, you figure it out.” This attitude towards public schools is not surprising, considering Bob, nor his children attended public schools. It’s easy to see no need for something you have never needed. Of course no evening with Bob would be complete if he didn’t perform his only tricks. When the topic of Farm Land Preservation came up, Bob went to his go to lines. First he said (16:45) he agrees with and likes FLP, but he doesn’t think it’s proper for elected officials to take tax payers dollars. Does this mean Bob will, if elected, work for free? After all someone voted for the wages of the legislators, and some of them are still there, would Bob abstain from voting on pay raise, since he might benefit in the future? Bob attempted to say that Rep. Wilson had sold nothing, since he still owned the land, and if he chose not to develop it, then he didn’t have to, that he had simply been paid the money to continue to do what he was already doing. One problem, as Rep. Wilson pointed out, he did not simply sell the development rights while he owns the land, or even his heirs. No matter who buys the land, or who sells the land, no one will be able to build a development or industrialize it, forever. Rep. Wilson explains this to Bob later in the give and take, Rep. Wilson explains how having this land in FLP prevent impact on the infrastructure, like paramedics, and schools along with other services. But Bob only cares about his mission for the MOB, which is to attack Dave Wilson. It is at the mark of (21:35) when the audience turned on Bob, this was the first applause of the night and it was for Dave Wilson. At (22:30) Bob makes the mistake in asking for a show of hands of all those who knew about FLP and how to research who participates. Many hands went up, though Bob tried to down play it. It seems that while many in the room knew that it was posted in the newspaper, Bob did not. Another topic (23:35) was political party participation over the years. Of course Rep. Wilson had a long list of groups and activities he had been a part of for the GOP since 1968. Bob on the other hand had excuses. Seems Bob was too busy raising his kids to be able to do anything else. One might wonder how Dave Wilson managed to raise children, be a farmer, and build several successful enterprises, and also be a public servant. If Bob can’t multi-task, how will he be able to be a legislator and hold a job? And does this mean he is done with his family? Will they never see him if he is elected? As I have stated here before, and which Bob confirmed at the debate, he has been completely uninvolved in politics and local government, right up and until he decided to run against Rep. Wilson. Oh he talked about issues with his wife, but his concern never led him to reach out to anyone in government, not even the man he is now challenging. In fact, in a bit of a gotcha moment, Bob was asked if he knew the name of the Mayor of Greenwood, he did not. So, Bob lives in the Greenwood ZIP code, and doesn’t know who the Mayor is. This speaks to the fact Bob has never been involved until the Greenwood MOB talked him into running. Oh the arrogance. In fact he had never met Dave Wilson until the morning he told Rep. Wilson he was running against him in the primary. The first time ever! Then we come to the real reason for Bob’s misguided run against Rep. Wilson, the Register of Wills race, in which Dave Wilson supported the best person for the job, instead of the Republican Cindy Green. At (27:15) Bob says he needed a reason to run against Dave Wilson, and states that the fact Dave Wilson had supported a Democrat over a Republican was good enough. This once and for all, in Bob’s own words, shows he is running to settle the score for Cindy Green and the rest of the MOB. And in a long and round about way, he confesses that yes, for him, party affiliation is more important than choosing the best person to serve the citizens. Finally, there were two example of what we have come to recognize as “big government conservatives”. We saw a lot of this with the Jeff Christopher campaign for sheriff. It’s when so-called conservatives show their inner selves. That it isn’t about smaller government, it is about them being in charge of the government. Spending is fine, as long as they get to decide what the spending is for. I have to jump back to the point in the audio at (20:00) when Bob Mitchell says he doesn’t care if money in the budget is set aside for specific uses, to him it is all one big pot. Haven’t Republicans been critical of using money set aside for specific uses as a general fund? Haven’t we been fighting for lock-boxes? Isn’t that what Dave Wilson was fighting for this last General Assembly with FLP? Then at the very end, Bob says, “it’s not about cuts, it’s about moving things around”. So is he not in favor of saving tax dollars? As long as he is the one deciding how they get spent? Bob Mitchell is the worst type of candidate, running for the wrong reasons. He seeks out only the knowledge which he believes will help him get elected, and nothing more. He is running because some people convinced him he can win. He is running not because he thinks he is the better candidate, but because he simply want Dave Wilson out. He is shallow and arrogant, and his loss will be the greatest achievement of his political career. 27 Comments on "Happy Birthday Bob Mitchell"
What was your reasoning in mentioning Lisa Briggs’s husband? Just curious because you did not mention the wives of the rest of the candidates. Briggs was a local hot dog brand in Washington when I was a kid. They were the stadium dog at D.C./ RFK Stadium. Well, at least she’s married to her husband. Frank, you neglected to say that both Dave and Bob are married to their wives. As I read your blog, it occurs to me that you have not a clue why Bob is running. I could give a list if reasons in this comment but since you have proved your close mindedness, it would prove pointless. You display the mindset of the Republican and Democrat establishments. And it this point I am not sure which party you are in. Calm down Maya, it wasn’t a sexist thing. I know the Briggs’ very well, it was an inside joke that they will get when they read it, no malice intended. To “Rinnie Yoder” well I only know the reasons Bob has given in the conversations I have had with him, and the reoccurring theme is always the Register of Wills race. And let me thank you for your compliment of not knowing which party I am a member of. The fact you can’t shows I am open minded and not in lock step with some closed minded group. Unlike Bob who feels he can choose the best person simply by the letter following their name, I tend to look deeper. As I said, Bob, and obviously his supporters are shallow. By the way, Bob Mitchell sent me a private message, I no longer respond to him except in a public manner because he called me a liar. So Bob if you have something to say, take off the chicken suit and say it publicly. You lie for entertainment value. Its pretty funny sometimes. Calling you a liar is no big deal. Everyone already knows it. Have fun Mr. Sussex County Enquirer! Any other reader see me call Frank “sexist” or say anything to be viewed as a reason to be told to “calm down”? When have I called you sexist Frank? Actually never. I asked a legitimate question because it made no sense in the context of your post. I know you are used to having name calling fights with your readers, but I’ve always conducted myself appropriately when commenting on your blog. I think someone needs to calm down and it’s certainly not me. Maya, why so defensive? Here’s a friendly suggestion, when you read my comments, imagine a sarcastic grin upon my face. Sometimes I simply like to poke people in the ribs. Especially if I find them engaging and intelligent. If I find they can’t take the joke, I am more likely to to ignore them. Dear Mr. Jordan Warfel, first of all your absence as the Chair of the 35th District from the debate was notable, and along with your public support of Bob in a primary , demonstrative of your lack of integrity in that position. Like many of the shallow supporters of the shallow candidate Bob, when you can’t counter what is said, you simply call me a liar. Well knowing you like your candidate will not take off the chicken suit and actually attempt to disprove what I have said, I’ll tell you what. The next time we are face to face, I’ll give you the opportunity to call me a liar again and I’ll take the opportunity to settle your mind. Until then, please feel free to joint the conversation here and demonstrate exactly the shallow intellect which supports Bob in his vendetta against Dave Wilson. Are you “Maya, The Cat Woman,” from the Twilight Zone episode “Perchance to Dream,” written by Charles Beaumont? If so, do you lurk near the Haunted Mansion at Funland? No. I’m the cat woman who does not lick her own feet but gets weak men like you, Rick, to drop to their knees and beg to do it for me. I’ve been hanging out at the Haunted Mansion for years waiting to beg a Cat Woman to let me do that! I hope you’re not one of the unthinking morons who sit on the steps in front of the Funland public bathroom, blythely chatting and eating fries and a burger….on the same steps people use after walking on the vile Petri dish known as a public restroom floor. So, I see, like the cowards who do drive by shooting, the MOB member, Jordan Warfel did a drive by hit here. Drops in long enough to call me a liar, but too big a coward to stand and prove it. That entire bunch is lacking any sort of integrity, or intellect. Cindy Green, Jordan Warfel, Bob Mitchell and Sam Wilson. This political MOB has shamed the 35th long enough, it’s time the people of the 35th send a clear message, we are tired of the backwards thinking of the barely intelligible, and we will defeat them at the ballot box. Bob Mitchell first, then Sam Wilson, Cindy green next time around, and Jordan in time. The Republican Party is definitely in a place where unfortunately the lunes are in control of certain areas. We the right thinking Republicans can save the party, but it must start now. You may think you’re right. But, that doesn’t make it a fact. True Rick, any more than people like you are right. Mouse, I have worked on equipment in that kitchen, I would advise you to abstain. Gus n’ Gus does have great burgers and fries. And good breakfast, too. Gus lives in Alexandria in the off season. He used to work as a cook at one of the Washington burlesque places on 12th Street back in the day. He knew Fannie Foxx (who ended-up in the Tidal Basin with Congressman Wilbur Mills, around ’70 or so) and the other well-known “dancers” of the era. Well I guess sixty year old grease is the secret to a great burger. You might like the Millsburger…marinated in brackish water. Rick, after having been behind the scenes of that place, I wouldn’t take an unopened bottle of water from there. The grill where they cook the burgers is right in front of you when you order, and you see them take the burgers out of the fridge. If people were getting sick, they wouldn’t have stayed in business for sixty years. All I’m saying is, Gus &Gus is proof the health inspector may take bribes. ← Political Party Isolationism Must End, Let It End Here.